DC Comics had a subsidiary imprint called Paradox Press from 1993 to 2001. It was intended as a venue for graphic novels which were neither superhero stories (DC’s specialty) nor fantasy/horror stories (Vertigo’s specialty). The best remembered titles are A History of Violence and Road to Perdition, both thrillers published in black & white in a reduced digest-sized format. The imprint never found a large audience, but graphic novels have since become much more mainstream. So the Vertigo Crime line represents a partial return to the Paradox Press model: black & white digest-sized graphic novels, but now devoted exclusively to crime stories. Vertigo hedged its bets with the first title in the line. 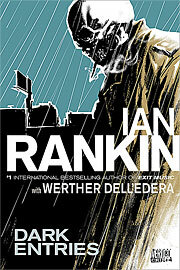 Ian Rankin & Werther Dell’Edera’s Dark Entries is a Hellblazer story (the front cover carries the description “A John Constantine Novel”). This hopefully attracted the interest of Hellblazer fans to the new line. I don’t see it as a crime story, really, but it is a mystery, so I guess that qualifies. The setup is a TV reality show called “Haunted Mansion,” in which a group of contestants must survive what were supposed to be ghostly events controlled by the producers. But the house seems to be actually haunted: unplanned things are happening. So Constantine is called in as a consultant, and he agrees to join the cast. The setting is a bit unusual, but it’s very much a Hellblazer story: it makes use of Constantine’s character and history in a way that wouldn’t work as well if he wasn’t the protagonist. I thought the first half was great, showing how Constantine got roped into the situation and how he worked out what was happening. Once we start seeing actual demons my suspension of disbelief got pretty severely challenged, but the story kept up a good head of steam right through to the end. Rankin is a crime writer best known for his “Inspector Rebus” novels. I last saw Dell’Edera’s work when he was illustrating Vertigo’s Loveless series. His drawing style is similar here. It seems a bit sketchier to me, but that may just be the effect of it being in B&W. Brian Azzarello & Victor Santos’s Filthy Rich is a vintage crime noir fiction story. Rich “Junk” Junkin was a high school and college football star but was injured during his first year in the pros. Now he’s a car salesman, trying unsuccessfully to trade on his fading fame. So his rich boss has another job for him: bodyguard for his wayward daughter, who often winds up in the gossip columns. Junk takes the job, and swiftly finds himself in over his head. He gets involved with both the daughter and an actress: is one of them a femme fatale? After a series of murders and a frame-up, we get the surprising answer. Azzarello of course is well known to Vertigo fans, most notably for his long running series 100 Bullets. Santos is new to U.S. comics, but was the creator of a French series. 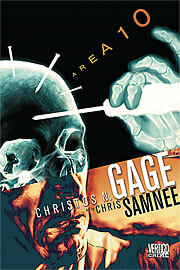 Area 10 was created by Christos N. Gage & Chris Samnee. Definitely the best story in the series I’ve read so far. It’s an exciting crime story with lots of twists and turns, and has an effective Vertigo-style creep factor, as well as a touch of the paranormal. The thrills come from the pursuit of a serial killer called “Henry the Eighth” because of his habit of decapitating his victims. The creep factor comes from the ritual practice of trepanation, which involves drilling holes in the skull to achieve enlightenment. In this story trepanation actually works, producing “the Sight,” the ability to see probable futures. Protagonist NYPD Detective Adam Kamen becomes trepanned accidentally, or so it appears. As he closes in on the killer his involvement looks less accidental, and could he be the killer himself? Very well done. I recommend it to thriller fans. Gage has written comics for Dynamite, Marvel, Wildstorm, and IDW; Samnee has drawn comics for Marvel, DC, Dark Horse, Vertigo and Oni Press. Finally, Andy Diggle & Victor Ibañez give us Rat Catcher. This story revolves around an assassin who silences mob informants. Most of the F.B.I. agents and U.S. Marshalls involved in those cases don’t believe the Rat Catcher actually exists, because so many of the deaths can be attributed to natural causes. The assassination which opens this story gets messy, and it seems that a rogue F.B.I. agent named Lynch may be the Rat Catcher. His partner Burdon sets out to find him…or at least that’s how it appears. It’s a good crime story, with lots of twists.Things don’t completely come together until the end (which is also a bit of a cliffhanger, but in an intriguing way). I do have a fundamental issue with the story: like most of the other books in this series that I’ve read, I’m not sure that it really needs to be a graphic novel. It would work at least as well as a prose novel, if not better. It would make a good movie, also. But it’s an exciting read in this form. Diggle worked on Hellblazer and created a new version of The Losers for Vertigo, in addition to other work for DC and Marvel. Ibañez is fairly new to comics, having done some previous work for DC. 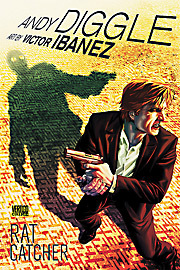 This entry was posted in Vertigo comics and tagged Andy Diggle, Brian Azzarello, Chris Samnee, Christos N. Gage, crime fiction, Hellblazer, Ian Rankin, John Constantine, Victor Ibañez, Victor Santos, Werther Dell’Edera. Bookmark the permalink.